Well, it has been a few days now and I am finally getting back to normal after an amazing experience with Hurricane Bill. We traveled to the coast Friday evening and camped at Anastasia State Park for the weekend. This turned out to be an excellent call as the epicenter of Bills swell landed right at our feet. No searching around the state for the best break. 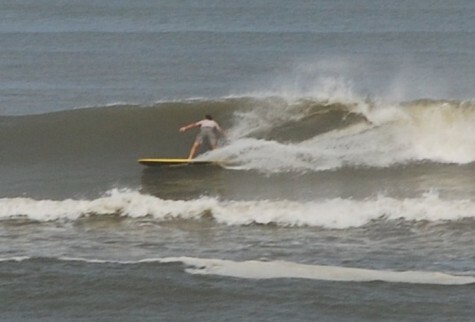 Having reviewed the pics pouring in from up and down the east coast, it’s safe to say that St. Augustine was going off! Bill brought incredibly clean, long period swell and a variety of face shapes (as the tides changed the waves throughout the weekend.) The good size, at times approaching double overhead, was tempered with ample time between sets for getting into position. If you paid attention to the patterns, paddling out was no big deal…if you got to casual, well, then you got thumped and beaten like a rag doll! Needless to say, I kept focused and was rewarded with some of the best rides I can remember! Saturday morning began with a bang as the largest of the swell was working it’s way in. The tide was making for what I consider violent pitching bombs. There was no easing into the session, just pick the wave carefully (for me that means wait out the back and claw for the biggest wave possible) and point the nose down. Riding a 9-1 HP longboard in macking surf has it’s advantages…covering some distance between sets on the paddle out and early entry. The disadvantages are it’s impossible to duck dive if you get into the wrong place and if you get hung up on the lip or flail in the barrel with that board there’s a good chance of getting knocked silly by it and then held under as it tombstones. I did not miss a single drop on Saturday and my fear of getting worked resulted in hanging in there for what turned out to be the biggest, widest, fastest barrel of my nearly thirty years surfing. While many folks are debating about whether Bill was the best swell ever, I have my theories. I think it largely depends on how your session went, your surfing style, ability, and attitude. As for me, I love the drop. I especially like those way outside sets and dropping in before passing by the majority of the lineup that’s now scrambling to safety. I enjoy a powered up ride and snapping my longboard off the top, so I can drop again…no nose riding for me (perhaps, till the reform on the inside). Bill was ideal for my kind of ride. As for ability, I’m certainly no pro. Being over 40 years old I think I may just be a late bloomer. My skills are continuing to improve and this means that any big swell could easily be my own best swell ever. And my attitude, it’s all bonus! A good swell is anything that’s rideable, like most things in life it’s what you make of it that matters most. Having a young son also helps, cause I now look forward to even waist high days where we can surf together. Just a few hours after this post, Dylan and I hit Blue Mountain and scored some perfect glass waist high peelers…brilliant orange sunset with a half moon rising…perhaps the new best session ever! This entry was posted in Announcements on August 27, 2009 by Mike Sturdivant. Nice words Mike. Sounds sooooo awesome! I wish I had enough experience to go out there with you guys-all in good time.